The mac is back for AW13 and SS14 and with the glorious weather (for ducks) looking like it's settling in, it's time for us to grab a classic, versatile and ultra stylish trench coat and venture outdoors! 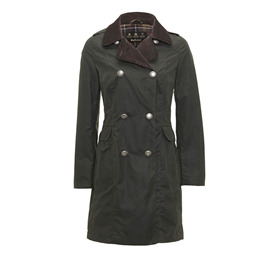 Take a peek at the gorgeous Barbour Addington Coat which embraces classic military style - another key look for 2014. Also, coming this spring we will be introducing new lines from Barbour, including the reversible Cedar Trench and the Barbet and Grasmoor Jackets. For those amongst you organised enough to be thinking about your A/W14 wardrobe already, this week's London Collections: Men will have given you plenty to add to the wish list. Modern military makes a comeback, promising a parade of smart, fitted coats next winter. Be sure to hold on to this season's heritage items as the theme continues with natural colours replacing the bright tartans of 2013. Natural fabrics and colours will be key, in herringbone and tweed designs and classic cuts. The look takes a turn towards the modern dandy; silk ties and handkerchiefs and brogues at the ready. Unleash your inner explorer from summer onwards, in smart/ casual fitted suits and natural colours and fabrics evocative of the glamorous days of foreign travel and British colonists in foreign lands. For those dreaming of their perfect summer wardrobe, look again to muted, natural colours, tone down the check shirts of AW13 with lighter colours and get adventurous in camouflage prints, casual, collarless shirts and coats in lightweight, technical cotton with functional strap fastenings. Inject colour with pastel and powder shades and expect to see these colours worked into functional and military designs.